You go big. I’ve been working on some different types of projects lately and one of them is a 3-D card. This card will give you a ton of room so you can say everything you need to say. And it still folds up small. 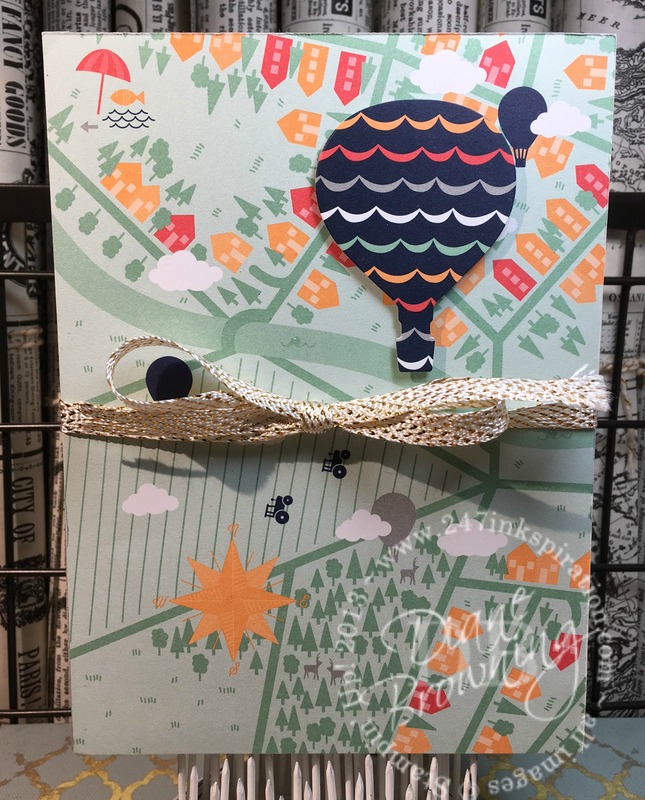 This card is built on a chipboard base and covered with card stock and pattern paper. The chipboard is approximately 4.25″x6.25″. Here is the front side of the card. You can see the ribbon ties into a nice bow so you can keep it closed until you’re ready for delivery. This is the back side of the card. The ribbon is glued to the back side of the chipboard first. Then the pattern paper is glued over the top of the ribbon to hide it. The inside of the card folds out. You can make it as long as you like. Each inside panel is 6″x4″. To connect them, I cut my paper 6″x12″ and then folded every 4 inches. To accommodate four letters, I used one sheet that was 6″x12″ and one that was 6″x8″. They overlap and are glued at the second letter. I used just plain White card stock for the base and then it’s covered with the Carried Away paper from the Sale-abration Catalog. 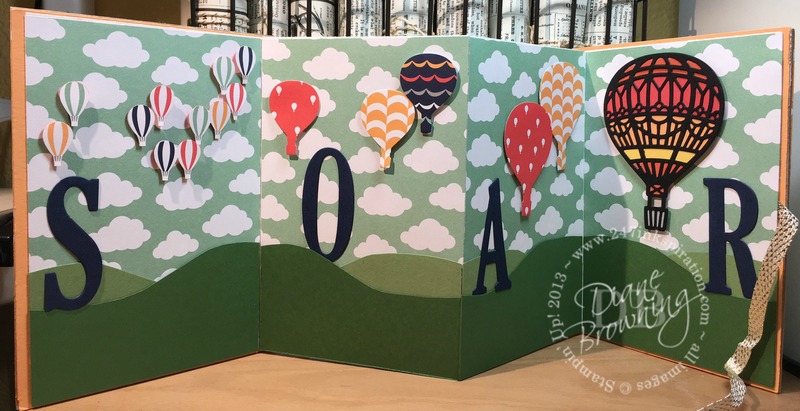 The cloud paper from the Carried Away pattern paper coordinates perfectly with the Up & Away Thinlets. You can see each panel has the hot air balloons in it. I tried to give the illusion that the balloons are farther away on the left and as you move towards the right, they get closer to you. The mini balloons are cut out from the pattern paper. The other three panels are all die cut balloons in graduated sizes. The wavy green strips at the bottom are supposed to be hills that the giant letters sit on. You could make this kind of card for any occasion. 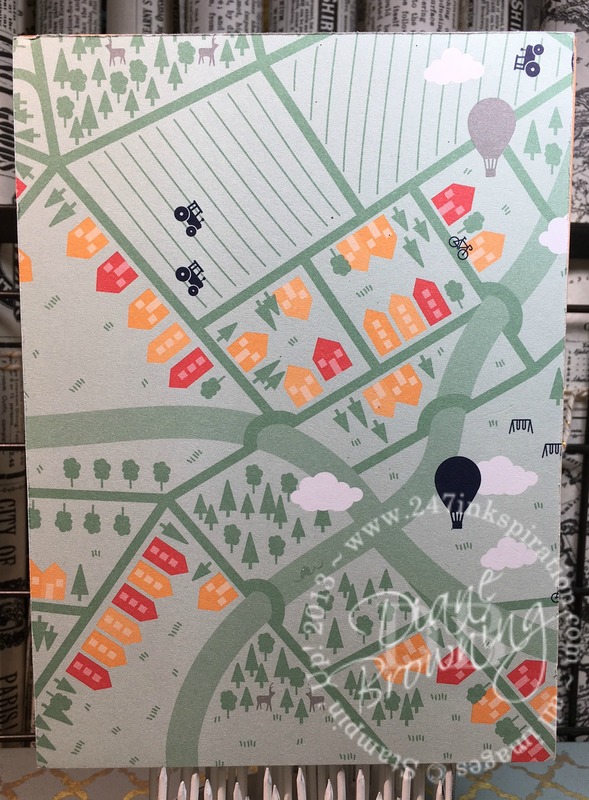 If you decide you don’t want to scribble across the front side, you can write on the back side in the middle panels and still display the pretty front side. I’m working on some more of these 3-D cards in other designs. If there’s something specific you’d like to see, let me know and I’ll see what I can come up with. Eek! We are down to the last 3 days of Sale-abration. I don’t know about you, but it has gone by quick this year. Have you gotten everything you hoped to? If not, it’s not to late to place one more order to get those goodies. The Sale-abration products are now while supplies last. The Gold Card Tin and 6×6 Glimmer Paper Pack are now sold out but there are still lots of things to pick from. For every $50 purchase (pre-tax and shipping), you can pick one free Sale-abration item. 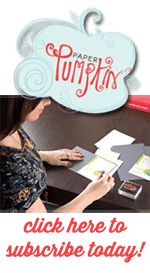 An even better deal is signing up to be a demonstrator so you can always get your craft supplies at a discount. And during Sale-abration, you get an extra two free stamp sets of your choice when you sign up. That’s approximately $229 worth of products for only $99. That’s more than half off! You can build a business or just be your own best customer, the choice is up to you. Let’s talk if you love a good deal.